OK here goes nothin...Angel of Tada!Creations has tagged me on her blog. I'm supposed to entertain you with 7 random facts about myself that you may find vaguely interesting. 1. Although I would love to say I have a fashion design degree...I don't. I have a bachelor's (and Master's) degree in violin performance. Not that you would ever know it with the sad state of my lonely violin these days. The biggest workout it gets is playing "Twinkle Twinkle Little Star" with A who is the true virtuoso of the house! 2. I'm a self diagnosed germ-a-phobe. I wash my hands a billion times a day, carry instant hand sanitizer in my purse (and car) and should probably invest in stock for Clorox wipes. My obsession is somehow magnified by pregnancy when I have been known to crave the smell of bleach. I can't pass on my maternity clothing because my jeans inevitably have white knees from my constant need to sanitize my floor. I should probably seek help regarding this point. 3. I love green....surprising isn't it?!??! 5. I have an obsession with painted furniture. I like to buy things that have already been thoroughly abused by generations of other families. I have put myself on a "painted furniture diet" and have promised to be better behaved in the future. After purchasing this house (about a year ago) I have actually acquired a few pieces that are (gasp)....stained...not painted! Although they have been thoroughly abused as well! 6. I can't, don't, choose not to (however you want to say it) cook. I had 20 minutes today...in between ballet lessons with J and picking A up from preschool. I didn't think it was enough time to sufficiently get into any real trouble. I have a favorite shopping spot. It is an old farmhouse turned business called The Cottage Door. The owner is a fun 30-something mom who stocks the house with all kinds of refurbished cottage decor. She will paint anything you bring in and has serious talent choosing colors and finishes for the pieces she displays in her shop. I only allow a trip once a month because as soon as I walk in my judgment becomes impaired and inevitably start drooling over large pieces of furniture even though my conscience is telling me I have nowhere to put them! Today I was especially well behaved. I actually only stopped in to check on the progress of a shelf I am having painted. (I am a serious do-it-yourselfer....but I couldn't resist her offer to paint it for TEN dollars to match a dresser I had already purchased there!) I even left my purse in the car. I went straight to the owner and began my inquiry about the shelf. Unfortunately, our conversation lasted just long enough for my eyes to wander over to a nearby shelf where she had 2 vintage cameras neatly nestled among a few other treasures. A few laps around the store later and I had 4 new "old" cameras in my hand...and back to the car I went to retrieve my purse! I haven't decided on an exact spot for their new home just yet. I have a large collection (uhh-hum..."shrine") of black and white photos of A and J in my home. I'm thinking the cameras would make a great addition! I'll be sure to share the super cool avacado green dresser I purchased as well...just waiting for a enough light to snap some pictures of the almost complete nursery! Happy Easter from our house to yours!! Yipppeee!!! We have a winner! I can't wait to get started! Nic...send me an email and we can chat about what type of CUSTOM TEE would make you smile! Thanks to everyone for the comments. I've got a fresh new list of books...now if I can only convince my kids to let me read them! Off to hide "Johnny Lion" and hope for the best! We did it. We survived 12 hours in the car, the hotel, the "L", the downtown mob, and we had a BLAST! I can officially say that A and J have never had so much fun in such a short amount of time! We shopped the American Girl Store (A got "Mia" and J picked out her own Bitty Baby), saw the Shedd Aquarium and The Museum of Science and Industry, Ooohed and Ahhhed at the top of the Hancock Building, rode the train, swam at the hotel pool, and had Chicago style deep dish pizza at Edwardo's! A huge thanks and big hugs to my sister (The Writer) and her family for coming along with us and making us laugh so much our sides hurt. Of course I took plenty of photos. I'll try to resist sharing them all ;) And as if the girls weren't thoroughly spoiled...as soon as we returned home we continued the Spoil-a-thon. What would Spring Break be without a trip downtown to see Disney's Princesses on Ice! And now I must see to the piles of laundry and dirty dishes that have since accumulated! 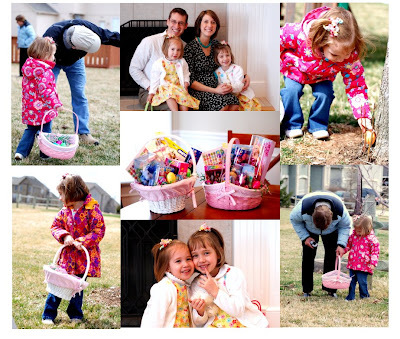 Be back soon to announce the winner of the FREE *take a bow* TEE and a few Easter pictures too! Tonight while tucking A and J into bed...I read "Johnny Lion's Book" for the 6001st time. I'm not kidding...seriously. I can't even tell you what that book has been through at our house. You would be disgusted I'm sure. It isn't the well-written prose by Edith Thacher Hurd that compels us to read on...nor the 2-tone pencil drawing illustrations...both are equally awful. There are no charming "Seussical" rhymes or metaphors that ask us to look deep within. Just a really boring story about a little lion...his fairly lame adventures...and paragraphs of repetitive sentence structure (I have mentioned that we have a bit of lion fascination at our house haven't I?) Yet my girls have some sort of inborn fascination with this book. As you can see from the picture...it is in sad shape. It has been scotch taped, duck taped, and glued. I once thought about buying another copy on ebay...but then...I would have a back-up copy...and I'm truly hoping someday this book will magically disappear! It isn't that my youngsters don't have quality literature. They have bookshelves full of wonderfully compelling stories. They just LIKE "Johnny Lion's Book". You may be asking...WHAT about the CONTEST...have no fear...I'm getting there! One LUCKY winner will receive a CUSTOM *take a bow* tee!!! Hoodie, ringer, babydoll, tank... your choice of style and fabric! 3. Stop back in next week when I announce the LUCKY WINNER of a FREE TEE! This week I am feeling a bit buggy. 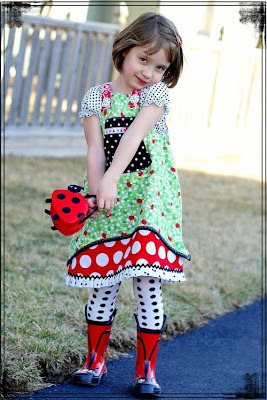 Spring is right around the corner...time to make your little one smile with a fun LADYBUG set! A had lots of fun modeling this one! Click the picture to go right to my newest ebay auction. And be sure to check back to the blog shortly! I will be posting a FUN CONTEST soon! I inherited this chair. And I love it like it is part of my family...because...well...it is. When I was in junior high I raced home, grabbed a giant bowl of Cheetos, and swung my legs up and over the sides of this chair. My Mom and I would watch "Andy Griffith" and discuss the complexities of my non-existent social life. I waited for my prom date in this chair. I announced my engagement from this chair...and a year later...opened my wedding presents in its faded cushions. And when we moved it to our house, I nursed my 2 sweet babies in this chair....sang to them...taught them their ABCs...and read our favorite stories. But I have to admit....it is UGLY. Of course I had it slipcovered in a fantastic array of vintage chenille while it sat in the girls' nursery. My sister (the Librarian) made that slipcover. I tell people that I sewed it...but that is really a lie. 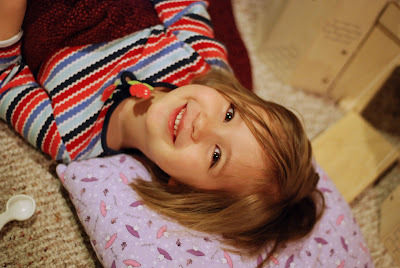 We spent the weekend working on that project...but she was the brains behind the design. I merely stitched along the dotted lines and nodded my head in approval. Next week I will spend the entire week playing, shopping, and goofing off like a little school girl. That makes this "the UGLY week". My goal is to accomplish all the "ugly" tasks in my life so that I can really let loose and have some fun. This chair has been at the top of my "ugly list" for awhile. But today I conquered it. It took me the entire day...but it is FINISHED! And it will have a new home in a cozy nursery on our 2nd floor where I will nurse, and sleep, and sing to my precious baby boy! We had the privilege of seeing our little guy up close and personal today! We counted fingers and toes, examined facial features, and double-checked that he really is a he...and he is! The girls have nicknamed the baby "Mr. Peepers"....that's a long story. But now I am really feeling the need to give that sweet face a real name....one that doesn't sound like a show on Noggin. We have several possibilities...I'll share when we narrow it down. P has a name commitment issue that we need to work out before we solidify the name. But the clock is ticking and I'm pretty sure "Mr. Peepers" won't make it in the final round. Everything seems to be progressing right on target. Hopefully this little guy will make his debut sometime towards the beginning of June! If you look closely in this one you can see his skinny little legs crossed. He had them up by his head the entire scan...limber little fellow! I see 10 perfect little toes! It all started with a simple request from A. Over spring break we will be heading to the Windy City for one last "all girl shop til you drop spoil-a-thon" before we add a boy to our family. My sister (the writer) and her three girls are coming too. I heart Chicago. And the girls are besides themselves preparing their babies for the pilgrimage to the American Girl Store on Michigan Ave. We have 8 baby dolls at our house. The girls have justly split their care in half in order to fairly share in the parenting duties. A's dolls are "Riley" (she is a Bitty Baby and will make the trip with us), "Shawna", "Samuel" (although he often wears dresses?!? ), and "Clap your hands little Baby"...don't ask. And yes...I'm serious. J has 4 babies in her care as well. Her favorite is "Rebecca" (soon to be replaced in the baby hierarchy when she picks out her own Bitty Baby), "Big Baby", "Sam", and "Cool look guy"...again...yes...I'm serious. So A insisted that I sew matching outfits for the "big girls" AND their respective babies. Like I said...it started as a simple request. Now two full days later I am nearing completion of my doll clothes obsession. I didn't know it was so fun. I never played with dolls and truly have never understood how one can find hours of entertainment dressing dollies in outfits, cleaning up their spits, and making them french fry soup. But SEWING for dolls is a completely different story. And seeing the look on the girls' faces when I emerged with perfectly coordinating ensembles made it all worthwhile! I'd love to be able to say I just whipped them up in an afternoon. But once I started I couldn't stop....I top stitched...added ric rac and cute flower buttons...added another ruffle tier. And when the dresses were complete...I decided the babies would be cold...and I made knit shrugs to keep their shoulders toasty. So if you haven't heard from me in a few days...this is why :) I think I am back under control now....as soon as I finish the matching hoodies for the big girls...I'll stop for sure...I think. Well I'm fairly certain I'm not going to be able to stand up from the computer when this is all over....but I'm done for this week! 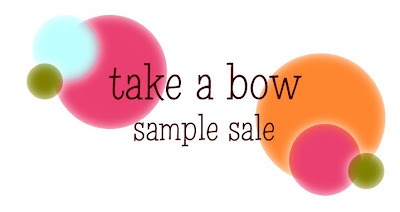 I've listed 45+ auctions...Take a bow samples, a few fantastic boutique resells, and a boatload of designer summer girls clothing! Get a serious jump start on your little girl's wardrobe!! Click HERE to see all my latest listings! We have had SUNSHINE 2 days in a row...it seems like we have won the lottery or something. The serious high I receive from being out in the sun tempts me to walk around the rest of the winter with one of those light lamps on my head until the sun stays out for good! So with the gorgeous weather today we decided to head out for some bike riding lessons....down to the cul-de-sac....around the trail and back to our house. A is starting to get the hang of it although when she gets scared she throws all caution to the wind and lunges with arms flailing for her Daddy! J just likes to peddle like a man woman...in no particular direction with no real plan of action....but at least she is going FAST! So of course I was chasing after them...with my pregnant belly...and my Nikon dangling around my neck trying to capture a few good photos of them having a blast. Here are a few of my favorites from the day! Today A had her 2nd solo violin recital. Talk about proud parents...we sat right in the front row and were generally completely annoying and obnoxious about how thrilled we were with our little violinist! A started taking lessons when she was just turning 4 through the Suzuki Method. She has come so far in a year and half! She played "Allegro" from Suzuki book 1 which is darn good for a 5 year old and I just have to brag :) J dressed up in a "fancy" dress too...just because she could. She brought baby "Rebecca" to the concert (this week's favorite baby doll) and together in the church pew they danced and twirled and bobbed their little heads to the music. And after we were done we met some friends at McDonald's for a greasy high-fat hamburger...kid paradise! And a cute pic of J all dolled up for the concert too!